A modern monster truck is more of a scaled up, four wheel drive dune buggy. As such, they generally aren't actual "trucks" and only maintain their name due to the common style of fiberglass bodies used on the vehicles. Trucks now have custom built tubular chassis, with four-link suspensions to provide up to four feet of clearance. Mounted just behind the driver on most trucks are the engines, which are typically supercharged, run on alcohol, and have displacement up to 575 cubic inches (9.42 L). Axles are typically out of either heavy-duty military trucks or road vehicles like school buses, and are modified to have a planetary gear reduction at the hub to help turn the tires. All trucks have hydraulic steering in both the front and the rear (four wheel steering), with the front wheels controlled by the steering wheel and the rear wheels by a toggle switch. The tires are typically "Terra" tires used on fertilizer spreaders, and have measurements of 66″×43″×25″ (1.7×1.1×0.6 m). Most trucks utilize a modified and/or custom designed automatic transmission, such as a Turbo 400, Powerglide, Ford C6 transmission, or a Torque-flite 727. A limited number of trucks utilize a Lenco transmission, which traces its roots to drag racing. Most of the automatic transmissions are heavily modified with transbrakes, manual valve bodies, and heavy duty gear sets. Trucks running a Lenco use a centrifugal clutch as opposed to a torque converter, which are used in automatic transmissions. Lenco transmissions are usually found in two-speed or three speed configurations, and are commonly shifted using compressed CO2. The trucks have many safety features, several required just to run in the small arenas that the trucks frequent. Trucks are equipped three kill switches: the RII (Remote Ignition Interrupt), one within the driver's reach in the cab, and another at the rear of the truck so that all electrical power may be shut off in the event of a rollover. Many trucks are constructed with the driver sitting in the center of the cab for visibility. Most cabs are shielded with Lexan (or comparable polycarbonate), which not only protects the driver from track debris, but also allows for increased visibility. Drivers are required to wear firesuits, safety harnesses, helmets, and head and neck restraints. Most moving parts on the truck are also shielded, and high pressure components have restraining straps, both in case of an explosion. Braden Smith's Spot Horn Action is the first monster truck to be outfitted in early 2011 with the new Generation 4 "Shellback" kevlar passenger compartment airbags which both isolate and protect the driver in the event of a fire, and protect the driver from objects intruding into the cab. It is expected that Smith will also debut its new allison aircraft engine powered Dragster Monster Truck titled "Spot Horn Action II" some time around June 2011 at the Bonneville Salt Flats in Utah. Smith stated, "I expect this will be the first monster truck ever to break the three hundred mile an hour mark." 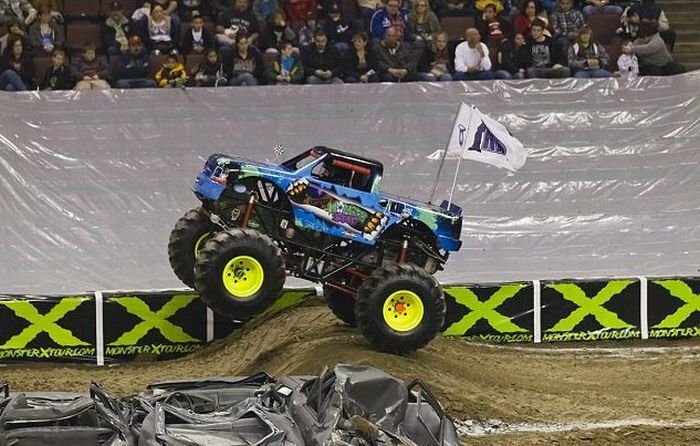 Despite these precautions, on January 16, 2009, at a Monster Jam event in Tacoma, Washington a 6-year-old spectator was killed when struck by one of the driveshaft loops, a safety feature to retain the driveshaft, that was crushed on an earlier jump and thrown into the stands.